ADULTS: $129.00 $109.70 KIDS: $64.50 $54.90 - YOU SAVE 15% ! Immerse yourself in the Yucatan Peninsula's most exotic underground world. Hike and swim through a labyrinth of cool underground rivers while surrounded by crystallized formations. Swim through the mineral-rich waters as the wonders of Rio Secreto unfold all around you. 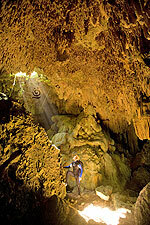 Gaze up at thousands of incredible stalactites, stalagmites and helictites. This is your time to check out the region©s wildlife, enjoy silence from the depths of the earth, and fall in love with the fragile beauty of the caves. After transport in a Mercedes Benz Unimog safari vehicle to Rio Secreto, our small group of 6 people or less will set off on an expedition of the largest underground cave system in the world. By walking and swimming, we'll explore over 2,000 feet of these phenomenal caverns. Rio Secreto will forever be in your memory. Schedule: Monday through Friday at 9:00 AM. Exact hotel pick-up time will vary depending on the location of your hotel, but will be specified on your tour voucher. Drop-off at your hotel between 2:30 PM and 3:00 PM. Departs: Pick-up and Drop-off at your Cancun hotel. If you have your own transportation, you can save some cost by booking Entrance Only and driving yourself to the tour location. Restrictions: This expedition is not recommended for people weighing over 250 lbs., those with severe back problems, any severe physical or motor handicap, serious heart problems, or for obese people or for those who suffer from claustrophobia. Children under 4 years, pregnant women and people under the effects of alcohol or drugs will not be permitted to participate in this expedition.